Guerrilla marketing is all about doing something different which gets you noticed but doesn't cost a great deal. The key aim of guerrilla marketing is to get your brand noticed in a big way. Because guerrilla marketing can be unexpected and unusual, it generally gets more attention than traditional advertising and when it is done correctly can do wonderful things for your brand. The great benefit of guerrilla marketing is that it can become viral and stimulate word of mouth. If people are talking about you and your business in a positive way then that awareness will increase the likelihood of long term success. 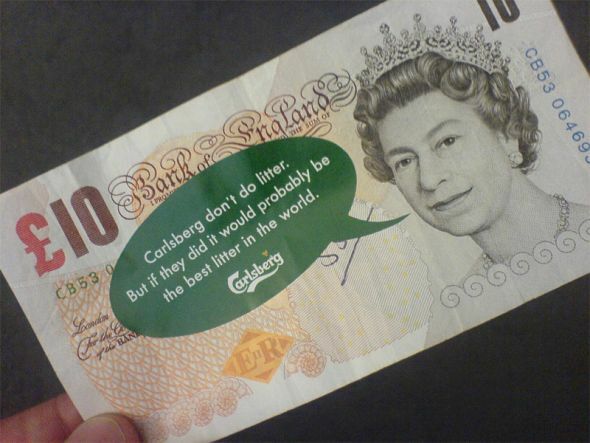 £5000 in £10 and £20 notes were individually dropped around the streets of London with a removable sticker that read, Carlsberg don't do litter. But if they did it would probably be the best litter in the world'. This campaign hit the national news, was all over internet and generated a lot of coverage for Carlsberg. In investment terms - let's consider the returns. Firstly, there is the media coverage where the story was picked up by the national news and national radio. Then there is the ripple effect of that story being picked up by the online news feeds and anyone else taking an interest (like us). Finally, imagine if you were walking in the street and found £20 with an innovative sticker on it. For a large proportion of people, this would be interesting enough to tell their work colleagues and family about (each time mentioning the brand). And let's not forget the enjoyment of spending 'free' money. Some may even re-invest it in buying themselves and their mates a round of Carlsberg! A great video - lots of fun and it had the desired effect of showing customers recording it on their mobile phones! And look at the number of people who have viewed it on youtube - 27,000,000 and counting. And the cost – choreography; dancers’ time; sound setup and arranging permission from Liverpool Station.